Hello everyone! It's been very busy behind the scenes here at SteamWomen, with much of our staff traveling. We're hoping to settle back into our regular publishing schedule as Fall sets in. If you're a maker who identifies as female - and would like to be interviewed/featured, please fill out this form, and we'll get back to you ASAP. 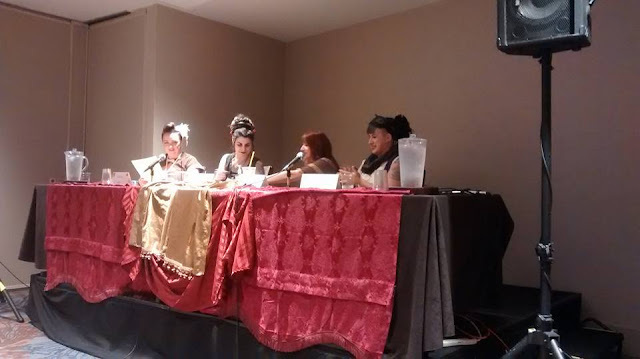 Over Labor Day Weekend, we were at DragonCon, where we held a SteamWomen Roundtable as part of the Alternate Histories Track. Much thanks to Doctor Q, aka Enrique Velazquez for including us in the schedule! For our panel we had Emmett Davenport, Samantha Stephenson, Talloolah Love, Tempest (as moderator), and alas our fifth panelist Sarah Shown was delayed en route and was unable to join us. Each of the panelists introduced themselves, Tempest described the founding and mission of SteamWomen, we discussed various issues, and experiences in the Steampunk community, and took questions from the audience - which involved a pretty full room - so thank you all who attended! -Emmett talked about the Clockwork Cabaret Podcast, and experiences of being a businesswomen running a Steampunk-themed cafe in a small North Carolina town. -Samantha discussed being one of the lone women majors in her college Sculpture department and the importance of learning/discovering how to make and do things. -Talloolah talked about producing burlesque shows, crafting community, and what she finds empowering in the performance process. -Do we find the Steampunk community more welcoming to women than other more "classic" genres found at DragonCon? It was generally agreed that Steampunks are very open and accepting of a whole wide array of folks, which is part of what makes it awesome. The fact that it's a bit newer on the scene (then say traditional Sci-Fi genres) was also believed to help boost that effect. There was also a subsequent discussion about the amount of female authors producing Steampunk Fiction - particularly Erotica, and consideration for why that may be so. -What did we suggest for starting community/gatherings/finding more Steampunks? We offered some resources to check out online (checking your area for facebook groups/events, looking at networking sites like meetup.com), looking for local gaming nights at cafes and restaurants, and other similar genres/gatherings. Steampunks tend to be involved in other marginal/sub-sculture groups (SCA, Renfaires, Bellydance, Goth, Gaming, etc), and where there's smoke, there's steam! A sampling from the panel and around the room pretty much confirmed that no matter where you are, there are probably some steampunks in the mix. -What were our thoughts on Steampunk models? It was pretty clear across the board that doing what you love, getting paid a fair wage for it, and making sure you get proper credit for you work is paramount, regardless of what it is you do. We do find it disconcerting when women in Steampunk are reduced to objects/things, rather than being seen as people - and the same goes for guys as well. Or when imagery feeds into some false stereotype that all Steampunk women look and dress a certain way. Photography should involve proper credit to the model, the photographer, and designer of what is being modeled. If a fantasy is being sold, then it's important that credit/identity are still attached to that fantasy, noting that the model has agency in his or her work. Again, it's a major part of our mission to show that diversity of talent and identity that can be found in Steampunk, and to particularly offer positive and inspiring examples to the younger generation. That not only can you look "cool" but you can learn to do and create amazing things as well. Stay tuned for more panels in the future!